The Matschie’s tree kangaroo lives only in the mountain forests of the Huon Peninsula. The beautiful fur is used for traditional decoration and is hunted for food by the local communities. 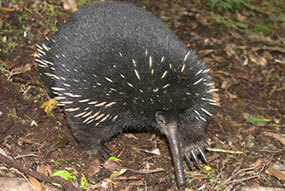 The long-beaked echidna is very rare and elusive, preferring to live in areas with little or no human presence. 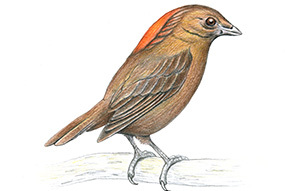 It uses its unique beak to search for earthworms and other invertebrates in the soil. 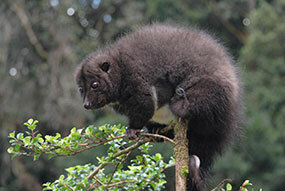 Common throughout the Huon Peninsula and New Guinea’s central mountain ranges, the mountain cuscus is nocturnal. The long-fingered triok is a nocturnal possum found in mountain forests above 1,000 meters (4,000 feet) throughout New Guinea’s central ranges and the Huon Peninsula. 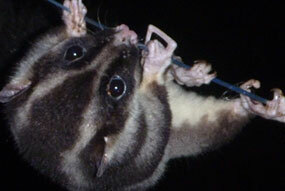 It uses its long finger to extract insects and small animals from tree bark and decaying wood. 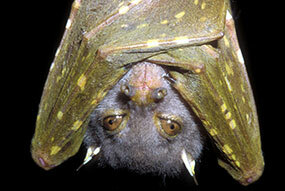 Tube-nosed fruit bats roost in living foliage and are found primarily in wet tropical lowlands, as well as in mid-elevation montane forests. The northern New Guinea tree frog is an arboreal species, living entirely in the high canopy of lowland and foothill rainforest. 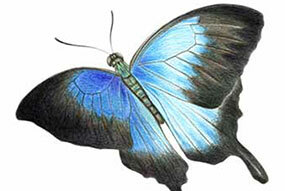 Also known as the Ulysses swallowtail butterfly, the blue emperor butterfly can be spotted in the gardens and villages of YUS. The species ranges throughout New Guinea and eastern Australia. 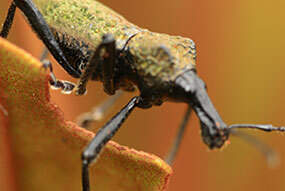 Often found in the coastal lowlands of YUS, the various species of jewel weevil exhibit different color patterns. 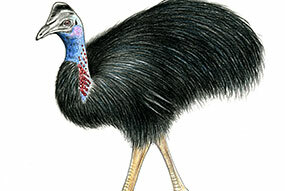 The dwarf cassowary is the largest native vertebrate in the forests of YUS. It communicates with other cassowaries using a low booming sound. 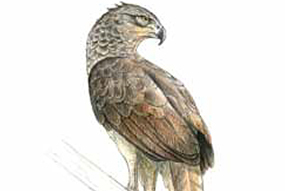 Often heard but rarely seen, the New Guinea harpy-eagle hunts large mammals including tree kangaroos, wallabies, and possums. It is distributed throughout the island of New Guinea, although sparsely populated in most regions. 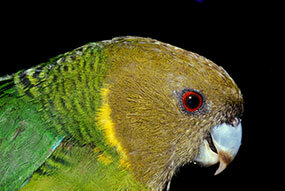 The New Guinea vulturine parrot is one of several large parrot species found in YUS. 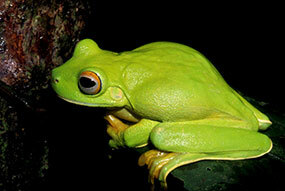 It lives primarily in upland forests and feeds on figs in the forest canopy. Found only on the Huon Peninsula, the Huon astrapia is a bird of paradise with a long black tail and a comparatively small body and head. 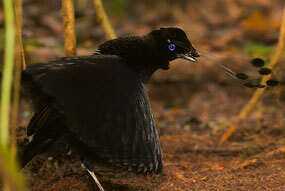 The Wahnes’s parotia is a six-wired bird of paradise found at a narrow elevation range in the montane forest interior of northeastern PNG. Males construct a unique dance-ground on the forest floor for their displays. 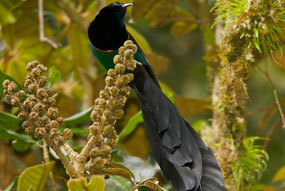 Only found on the Huon Peninsula, male emperor birds of paradise display communally in the upper branches of a canopy tree. 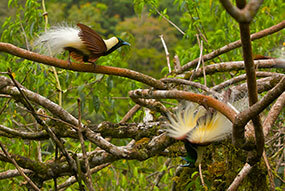 In the mating display, the males hang upside-down on the branch and spread their white flank plumes. 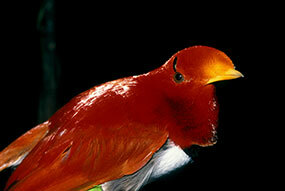 The frilled monarch is found throughout the lowland and hill forest interior of the island of New Guinea. 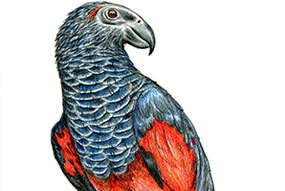 The Brehm’s tiger-parrot is commonly found in cloud forests throughout the Huon Peninsula and New Guinea’s central ranges. Found throughout the coastal and foothill forests of New Guinea, the king bird of paradise is the smallest of the mainland birds of paradise. 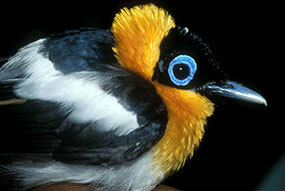 Males sing and display in the tangled vines of the subcanopy. 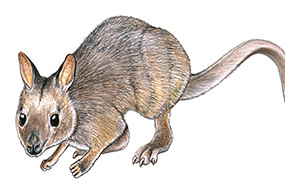 A medium-sized wallaby that lives in the lowland and mountain forest, but is also found at the forest-edge and in disturbed habitats. 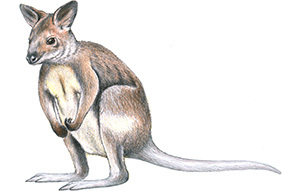 Very shy and difficult to observe, the forest wallaby lives in the mountains above 800 meters. It prefers to feed in grassland openings in the high mountains. The Macgregor’s bowerbird builds its distinctive stick bower in montane forest on slopes just below the crest of a ridge. The bower is built and decorated by the male in order to attract females for mating. The female alone builds the nest and raises the offspring.